Maysteel's CW300/CW200 Series Sectionalizing Enclosures provide a low-cost, safe and aesthetically pleasing means of providing a sectionalizing and tap point for underground distribution systems. Maysteel's CW300/CW200 Series Sectionalizing Enclosures provide a low-cost, safe and aesthetically pleasing means of providing a sectionalizing and tap point for underground distribution systems. 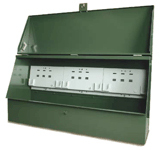 Available in sizes for use on single and three-phase systems rated 200A or 600A, 15kV through 35kV. In addition to a wide range of standard sizes in mild steel, custom and non-standard size enclosures and colors are available. Maysteel's family of Aluminum Sectionalizing Enclosures combine the strength and impact resistance of steel and the corrosion resistance characteristics of fiberglass. Maysteel's RUS approved Sectionalizing Enclosures are engineered to provide a durable and long-lasting enclosure for your underground distribution system. Munsell green (7GY 3.29/1.5) to blend with surroundings. Alternative colors available upon request. All units shipped completely assembled and packaged for ease of storage and installation.